Add some fun to your next Mexican-themed dinner party or event with our food accessories. 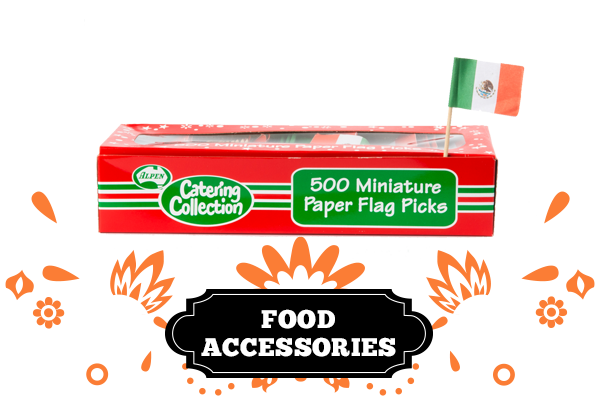 Dress up all of your authentic meals with some paper flag toothpicks! 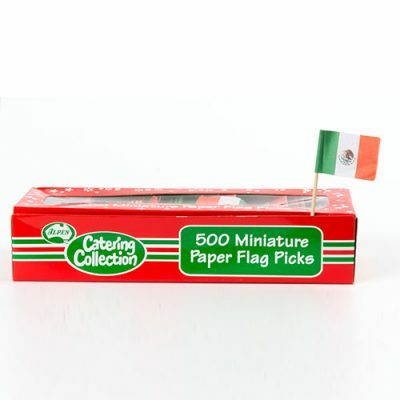 Made from quality toothpicks, these paper flags add a splash of festive colour to all of your traditional Mexican celebrations. Perfect little flags to represent Mexico and decorate your appetisers or cocktails. These food accessories are also a great addition to burritos, tacos and desserts. Wear the flag with pride as it is a symbol of hard work and dedication of Mexico and it’s people. The flag itself has a vertical stripe of green, white, and red with the national coat of arms in the centre of the white stripe. While the meaning of the colours has changed over time, these three colours were adopted by Mexico following independence from Spain during the country’s War of Independence, and after the First Mexican Empire. This form of the coat of arms was most recently revised in 1968. However, the overall design has been used since 1821, when the First National Flag was created. Red, white, and green are the colours of the national liberation army in Mexico. The symbol in the middle is the Mexican coat of arms. This is based on the Aztec symbol for Tenochtitlan (now Mexico City). The crux of the Aztec empire. The story behind the symbol is that it recalls the legend of an eagle sitting on a prickly pear cactus. That signalled to the Aztecs where to find the city of Tenochtitlan. The coat of arms is derived from an Aztec legend. The legend says that their gods told them to build a city where they spot an eagle on a nopal eating a serpent, which is now Mexico City. So, with that bit of history in mind, don’t forget to pick up you decorative food accessories today to support the beauty and history of Mexico!